The word curry as used in India is often simply perceived as gravy. In western nations, gravy is actually a sauce made out of the juice from meat, thickened with seasonings and flour. However, curry in India is much more than a sauce – it is a melange of a lot of thickening agents, spices and one main ingredient. Although there are host of curries available in India, each one of them is distinct and more mind-blowing than the other. 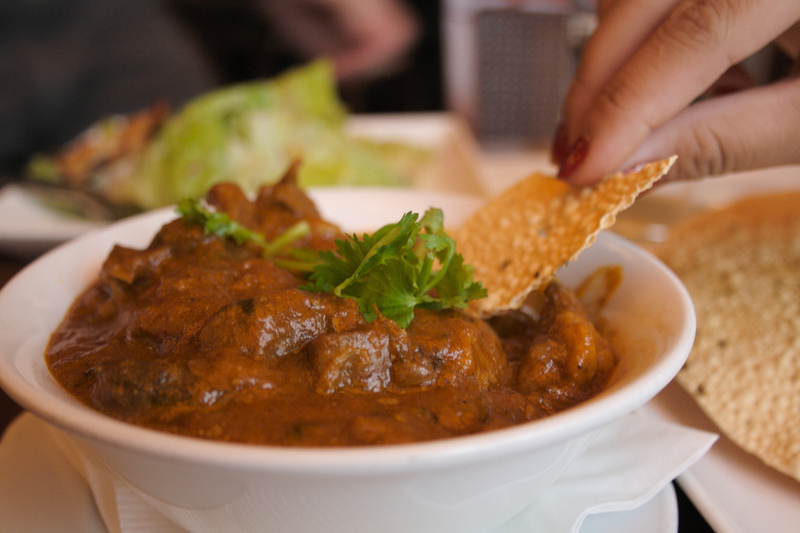 And one curry which is quite a favourite pick of the foodies from the culinary trail of India is – Rogan Josh. Rogan josh is an aromatic meat dish of Kashmiri or Persian origin and is also written as roghan ghosht or roghan josh. It is a staple part of the traditional Kashmiri cuisine. It is is one of the main dishes of Wazwan, the indigenous Kashmiri multi-course meal. Though Rogan josh is acclaimed to be a Kashmiri dish, it actually traveled to this land. The scorching summer heat of the Indian plains made Mughals frequently travel to Kashmir, because of its cooler climate. So, it was the Mughals who brought the dish to Kashmir. Rogan josh is an intense, tangy traditional Indian curry, made with red meat. The meat along with the bone is slow cooked in its own fat. And while it is cooking, some extra intense flavour is added to it. As the name suggests – ‘Rogan’ means meat fat & ‘Josh’ means heat – the meat justifies the rogan part and the heat-inducing spices which go into its making create the ‘josh’ (heat). This curry originally belongs to Kashmir, but is widely made in other regions of the country too like Lucknow. It makes generous use of Kashmiri red pepper, which gives the dish a bright red hue. The ingredient which distinguishes the Rogan josh made in Kashmir from the one made in other parts of India is fennel powder. Straight from a Kashmiri kitchen, here is the recipe of this sumptuous and mouth-melting curry that has meat stirred along with a host of herbs and spices. With this recipe in hand, you don’t have to wait to move out & eat it, rather make it yourself. Step 1: take 6 cups of water in a large pot and add ½ teaspoon salt and pieces of garlic. Boil the lamb and bones in the same water for over 20 minutes. After completing the boiling process, set the pot with meat aside. Skim off the strain, scum and save the cooking liquid. Step 2: take chilli powder and/or paprika and mix some water in it to make a past. Also, whisk the yogurt to give it a creamy texture and keep it aside. Step 3: heat ghee or oil in a pot and fry shallots in it. Keep frying until it turns light brown which will amount to almost 12 minutes. Step 4: add cardamoms, cloves, cinnamon or bay leaves and fry for 1 minute. Now, add coriander, ginger, fennel, turmeric podwer chilli paste and 2 tablespoons of water and stir continuously. Step 5: in continuation with the step 4, add the meat to the mixture. Sauté it for about 5 minutes. Now, lower the heat and add the whisked yogurt. Stir it well and sauté for a few minutes. Step 6: add 4 cups of water and salt to taste. Cook until the meat becomes tender. Remove the bay leaves or cinnamon or large cardamoms if intact, before serving the dish. Voila! Enjoy the lips smacking Rogan josh right in the comfort of your home. Rogan josh makes a perfect fit for dinner parties and is best served with the boiled rice or Indian breads – chapati or naan.